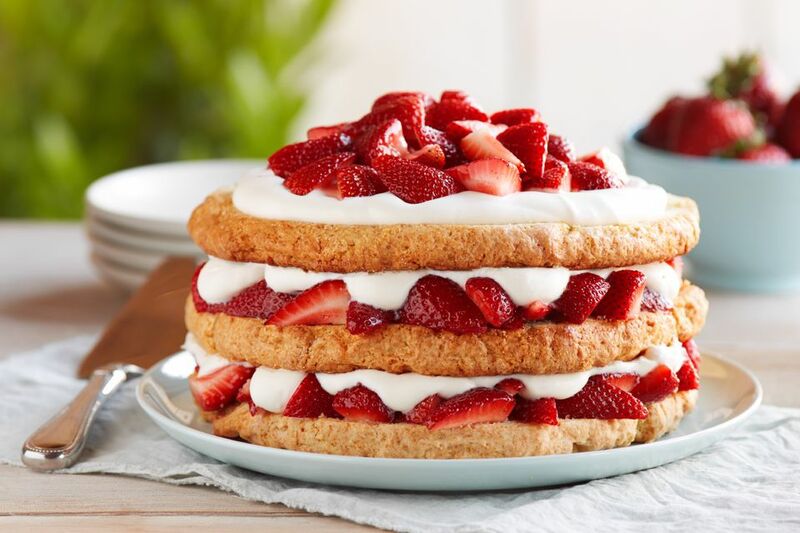 Strawberry shortcake is certainly one of the "official" desserts of summer, and while it looks gorgeous and impressive, it's quite easy to make. You can prepare all the components the day before and assemble just before serving. This recipe comes from Driscoll's Berries, folks who know their berries! Preheat oven to 375°F. Generously butter 3 (8-inch) round cake pans. Set aside. Combine flour, sugar, baking powder, baking soda and salt in the bowl of a food processor or large bowl. Add butter and pulse in food processor or cut in with a pastry blender or 2 knives until mixture resembles coarse crumbs. Gradually add the 1 3/4 cups heavy cream and pulse in food processor (stirring with a fork several times to help distribute cream) or stir into bowl with a fork until just moistened (do not overmix). Gather dough into a large ball (if using a food processor, first transfer mixture into a large bowl) and gently knead on a lightly floured surface, just until smooth (about 5 turns). Divide dough into 3 equal portions and with hands, press each piece of dough into a prepared cake pan, spreading to edges and making as smooth as possible. Bake about 25 minutes or until top is golden. Let cool 5 minutes in pans on wire rack then turn out to cool completely on wire rack. To serve, place first cake layer on serving plate and top with about 1/3 quartered strawberries in a single layer. Top with about 1/3 whipped cream and spread until even. Top with second cake layer and repeat with 1/3 quartered strawberries and 1/3 whipped cream. Top with final cake layer and spread remaining whipped cream in an even layer, leaving an approximately 1-inch border around. Top with remaining quartered strawberries in a mound. Serve immediately.